The Altamaha River is 138 miles of undammed beauty and biodiversity. Although used in the 19th century as a route for commerce between central Georgia and the coast, the river is nearly entirely still in its natural state, and was designated a bioreserve by The Nature Conservancy in 1991. The Altamaha River flows through a flood plain up to five miles (8 km) wide and consisting of some of the last remaining hardwood bottomlands and cypress swamps in the American South. As the river approaches the Atlantic Ocean it becomes a broad estuary. At least 120 species of rare or endangered plants and animals live in the Altamaha River watershed. The Altamaha River bioreserve has been named by the Nature Conservancy one of the 75 last great places in the World. On this trip we will explore the easternmost stretch of the Altamaha River - beginning in the cypress swamp and ending along the wild and beautiful coast. Day 1: We will kayak a 12 mile stretch of river, stopping for lunch, and ultimately camping on bluff that was once frequented by Native Americans. Day 2: We will kayak another 5 miles to a foot trail that will allow us to walk among some of the ancient cypress trees of Lewis Island. 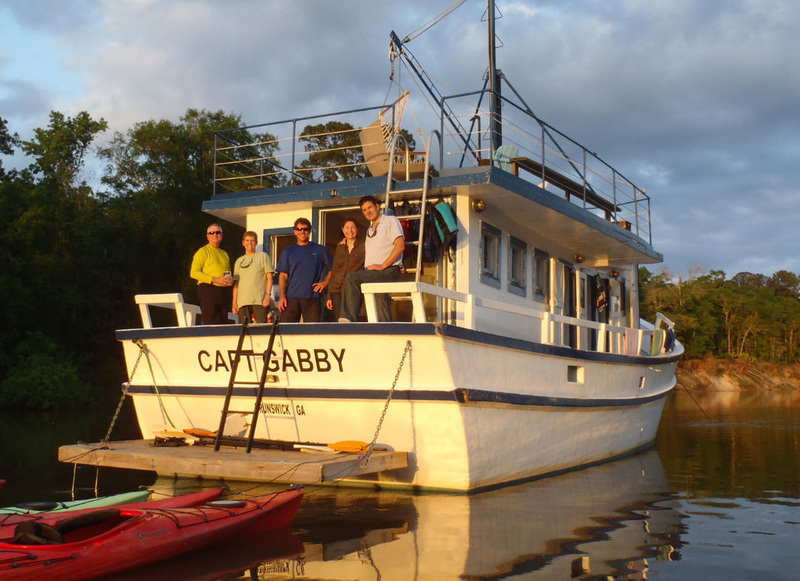 In the afternoon we will meet up with the Capt Gabby Mothership and load ourselves, kayaks, and gear on board. Day 3: We will motor closer to the coast, past the historic town of Darien. This day will consist of some paddling and hiking along Rhetts Island in search of alligators and waterfowl among the old rice plantation levees. Day 4: Where the Altamaha River meets the sea is a wide expanse of habitat for shorebirds. There are more than one island here that is federally protected for birds and is off limits to human visitation. From our kayaks and the Mothership we will observe and explore this dynamic area before returning to the mainland. Included: All meals, camping gear ( if needed ), kayaks and paddling gear, guides, captain, accommodations on board the Mothership. You need to bring: Rain gear, personal clothing, headlamp, reusable water bottle, shoes that can get wet and stay on your feet, sunscreen, a good sun hat and a good warm hat. Cost: $695 per person, no age limit, tandem kayaks available, only 6 participants MAX.